Has there been a rise in the rate of food allergies? Now they seem prevalent in school lunchrooms everywhere. Are food allergies on the rise? To answer this question simply: yes. The Center for Disease control estimates about a 50% increase in the rate of food allergies diagnosed in children under age 18. 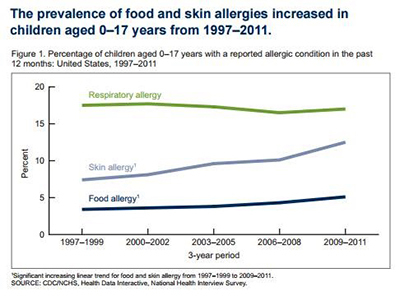 Why are food allergies increasing? Unfortunately, there is no definite answer to this question. 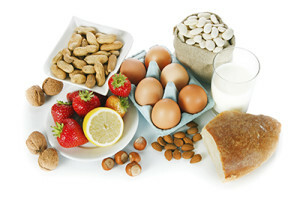 There are several popular theories for the increase in food allergies. The first theory, often called the hygiene hypothesis argues that the western lifestyle has become so hygienic that children aren’t given the opportunity to develop their immune system anymore. We develop our immune system when we’re exposed to germs and infections in our early infancy. If the immune system is weak, the system of the body that attacks allergens may overcompensate and react to harmless foods like peanuts or dairy giving children severe allergies. Another potential explanation centers on an argument against delayed exposure to foods commonly related to allergies. Parents are putting off feeding their children peanuts, shellfish or other foods they might be allergic to for fear of allergic reactions. A recently completed study in England found increasing early exposure to peanuts could decrease children’s likelihood of having an allergic response. Because of this study, the American Academy of Pediatrics is in the process of revising their recommendations* on peanut consumption for children. The simplest explanation for the recent jump in allergy diagnosis is that we’re getting better at detecting allergies. As the quality and availability of healthcare increases, fewer allergies are going undiagnosed. Alternatively, there is a theory that many food allergies are the misdiagnosis of other medical conditions. In conclusion, when it comes to food allergies, there is no absolute answer for the increase in diagnosis. One of the theories outlined above might be at the heart of the reason why so many more children are being diagnosed with food allergies today than ever before, or perhaps a combination of the theories above is closer to the answer. The safest bet is to talk to your healthcare provider about your child’s risk of food allergies, and support a diverse and nutritious diet for your family. Check out our other blog posts on feeding like How To Turn Your Child into a Veggie Lover, Picky eaters vs Problem Feeders, When to Start Baby on Solid Foods. *Always check with your child’s pediatrician before initiating any changes in your child’s diet and feeding practices. Learn ways to help your child try different vegetables. Great strategies for any type of picky eater!